Our company has been in business in Seattle, Washington for 24 years. Our products come with a 30-day return privilege: You will be completely satisfied or your money promptly refunded. Our rate of product returns is near zero – less that one tenth of one percent – because our products are well made, they do what they are sold to do, and our customers love them. That’s why our first-time customers become our life-long customers. We have many testimonials from our customers, insurance companies, police, and security pros; read them, then you be the judge. Please don’t be one of the hundreds of prospective customers we hear from after their home has been broken into or vandalized. The Scarecrow® helps to frighten away burglars, thieves, and vandals before they break in your doors and windows. Put a Scarecrow® at every building entrance for enhanced security. The Scarecrow® stands on-guard 24 hours a day. The super-bright flashing red LED – microcircuit controlled – is bright enough to be seen from the street at night. 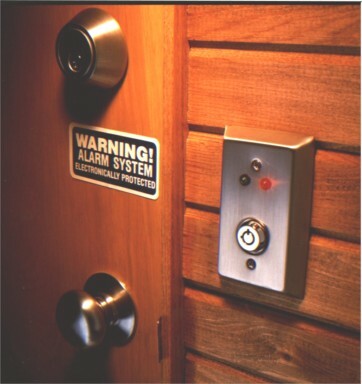 Note: Even if you have an alarm system, the Scarecrow® crime deterrent products will vastly reduce the chances of a broken door or window. When criminals see the Scarecrow®, they go away and look for easier targets. Do I need special tools to install these devices? No, a drill and screwdriver is all you need, and all our products install in minutes. Not at all. The Scarecrow® simulated alarm uses two AAA batteries, and those batteries can last years! This makes the Scarecrow® the ideal security device for anywhere! Thousands of customers say they do, along with insurance companies. See our testimonials for comments from our customers. The Scarecrow® simulated alarm sounds great! Are there any other additions I can make to my security setup? Yes, see our Other Security Devices for more low cost but effective security products and our WindowGuard™ window sensors, as well as our Guardian 3000 simulated vehicular alarm. Shipping/Delivery Most orders are shipped promptly upon receipt. Please allow up to 6 weeks for delivery. Product Returns If you are not pleased with any item ordered, you may return it within 30 days for a full refund less shipping charges. Feedback Welcome We welcome your feedback and suggestions regarding our products and service.